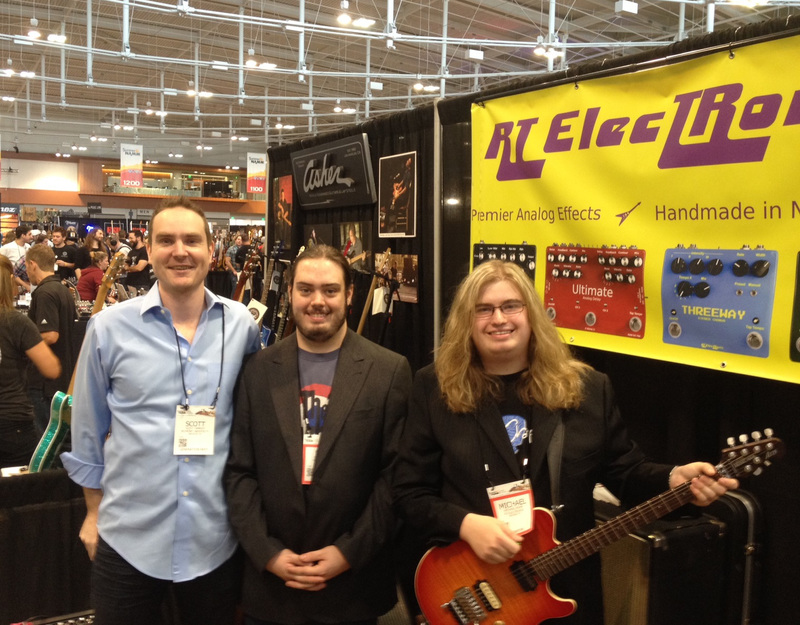 Belmont alumni and Audio Engineering Technology majors Nate Taylor and Michael Rohr started their own company, RT Electronix, that specializes in the design and manufacturing of guitar pedals. This year, the duo will debut as exhibitors at the Summer NAMM music product trade show in Nashville. Their multi-band compressor pedal is regarded by industry professionals as especially innovative and noteworthy. Shown in the photo are Belmont’s Dr. Scott Hawley, Physics, (their old electronics professor), with Nate Taylor and Michael Rohr. NAMM, the National Association of Music Merchants, is a nonprofit association that promotes the pleasures and benefits of making music and strengthens the $17 billion global music products industry. The association — and their trade shows — serve as a hub for people interested in the newest innovations in musical products, recording technology, sound and lighting. NAMM’s activities and programs are designed to promote music making to people of all ages.